James Bond just kills people and beds beautiful women. Hannibal does all that and somewhere, when he has the time, he eats them, arranges them in beautiful formations or helps us admire how blood can enchantingly squirt from a severed artery across a clean white wall. And, I do mean the TV series, now in its 3rd season, although the movies are cool too. Long time ago, I came across Manhunter Red Dragon (not the pathetic remake “Red Dragon”), which introduced me to the word of killing people for fun, and Hannibal (at the time played by some other British actor), enjoying himself. Then Silence of the Lambs with Agent Claricccccccccccce Sssssssssssterling and the bottle of Chianti. And a few days ago, I finally found time to watch Hannibal Rising, which I loved, for the death, the illustration of pain turning into psychosis and of course Lin Gond (sexier Joan Chen) with Samurai swords. God created Ms. Gond to wield a sword and do terrible things to men. Weird timing, as just before that scary movie, I did a marathon re-run of the first 2 seasons of Hannibal, with the awesome Mads Mikkelsen (look for his other movies!). Hannibal kills. But he makes it look soooooo nice. Never before have you watched a movie or a TV show, seen the beginning where a single individual does his shopping, work, sports and YOU know that he is soon to meet Dr. Lecter. And, as the creators of the show intended, you KNOW what Lecter does. 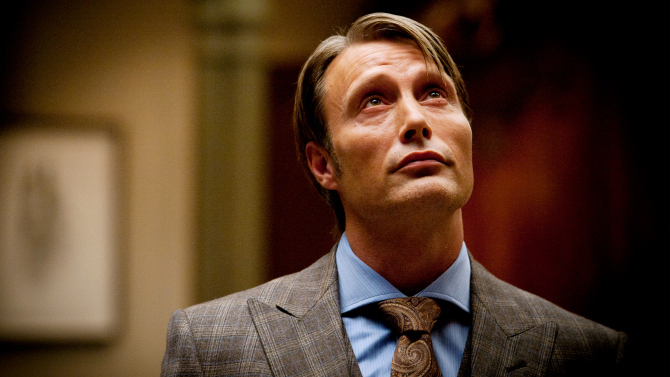 So, unlike CSI, when you expect murder, you watch Hannibal and enjoy the ripening of the… meat. Is the “Meat” training (for good meat taste)? Is the meat working (smart meat)? Is the meat scared (fear releases hormones that SPOIL the meat). Hannibal likes music, he loves his food, he appreciates beauty, he listens to opera, he can scare psychologists and confuse forensic detectives. In the meantime, he finds new meat (victims), plays with them, kills them, leaves some meat in the refrigerator and…. In the meantime, he is able to find other sociopaths and, have fun with them, by warning them of impending FBI investigations, FBI raids or… he simply talks to them about the aesthetical consequences of their work. Why dump a body in a river, when you can glue the body in a funny way to a ceiling? Simultaneously, the TV series Hannibal plays with the FBI by providing them with forensic advice about (other) sociopaths, advises them on cases of incarcerated psycho inmates (including one unlucky FBI consultant) and, best of all, invites the FBI geniuses to dinners during which he serves many amazing dishes containing meat. Hannibal scares you, makes you think of becoming HIM and also, instils the desperate, immediate need to become a vegetarian. Other sociopath being eaten: Cannibalism was common among our ancestors. The common link between us and the apes was missing, only because we ate him. Lecter: This isn’t cannibalism Abel. Cannibalism only happens when we are equals. Other sociopath: This is only cannibalism if you eat… ME. Throughout, we are shown taste, class, gene se qua, gravitas, and all the other cultural qualities that any well-bred member of the social elite can exhibit. Lecter enjoys beauty, music, opera, quality, food, tastes, smells, pheromones, emotions (of others), and the overall life experience. The movies made Lecter cool. The TV series makes him a role model. But can our society survive such examples of sociopathic perfection?